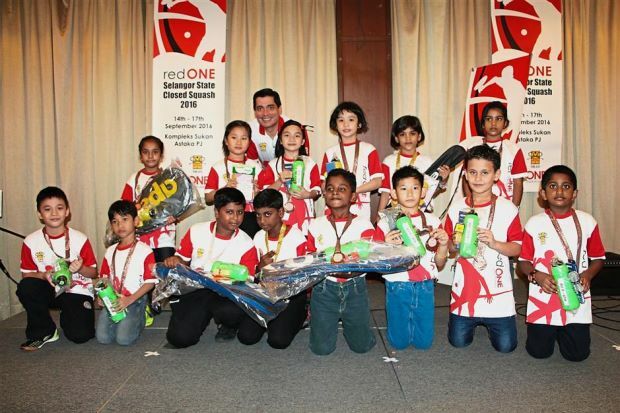 The Selangor Squash Association (SRAS) has successfully concluded the 2016 redONE Selangor Squash tournament with Malaysian telecommunications company redONE Network and presented awards during a dinner at the Sunway Club, recently, for 96 winners. Besides SRAS members, contestants, coaches, parents and sponsor representatives were also present at the dinner, including Gardenia and Petaling Jaya City Council. Awards were presented to winners at the function while participants also showed of their singing skills with entertaining performances at the dinner. A total of 120 contestants were selected from each category, including Under-9, Under-11, Under-13, Under-15, Under-17 and Under-19. The top eight players received T-shirts, hampers, racquets and medals. In addition, the association also gave an incentive bonus to four players in the game from other states to represent and participate in the tournament. The two players from Singapore and Penang each received RM500; the players in Kuala Lumpur won RM250 while the Penang squash squad received RM750. “We have learned a lot from this event. We have learnt how we can recover from failure and appreciate the spirit of sports,” said redOne Network Malaysia former chief executive Farid Yunus. Farid also thanked the participants, coaches and sponsors for all their support during the event.